Locaux30N30 30IN30 | Monique Math | Locaux! If social media or writing is your passion, success is sometimes a just one keystroke, click, blog or IG post away. Don’t believe it? Ask Monique Math. In this episode, she shares the multitude of ways you can make money online. She helps aspiring influencers or bloggers navigate developing successful blogs or social media profiles, and monetize. 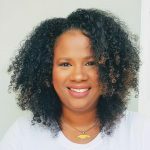 A professional blogger from Kingston, Jamaica. She has a number of income producing blogs under her belt and an online business teaching others how to earn an income through blogging or monetizing their social media platforms. A mother of one, Monique left the corporate world behind in 2017 where she pinnacled as the marketing manager for a popular chain of sports bars. She dreamt of building a blogging business while allowing herself more time to spend with her child. She describes the entrepreneur journey as bumpy, sometimes lonely yet so freeing and worthwhile and recommends anyone with a passion for story-telling and an interest in growing an income stream online to pursue that goal.